Each year in the USA, over 15,000 children fall from open windows. Our child safety window guards are a great economical solution for protecting double hung windows. They are designed to pivot open for emergency access and feature a pin lock for safety around children while also offering the ability to padlock for security. Easy to install with 4 mounting screws, these window guards can be mounted either on the front or inside of the window frame. Window guard swings open for easy access to window for cleaning and emergencies. 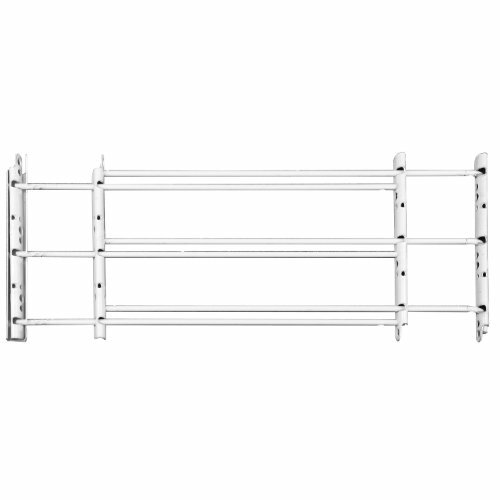 Made of solid steel, this 3-bar child safety guard fits openings from 24-inch to 42-inch wide and a maximum window opening height of 14-inches. White powder coat finish. Note: This base model of the 1130 Series installs fixed (locking channel and safety release pin are sold separately to complete swing-open installation). If you have any questions about this product by John Sterling, contact us by completing and submitting the form below. If you are looking for a specif part number, please include it with your message.